Red Bee Balm, Pink Yarrow, Echinacea, Roses and Rudbeckia growing in the front garden. Welcome to “The Gardens” At Exotic Gardening Farm & Wildlife Habitat. 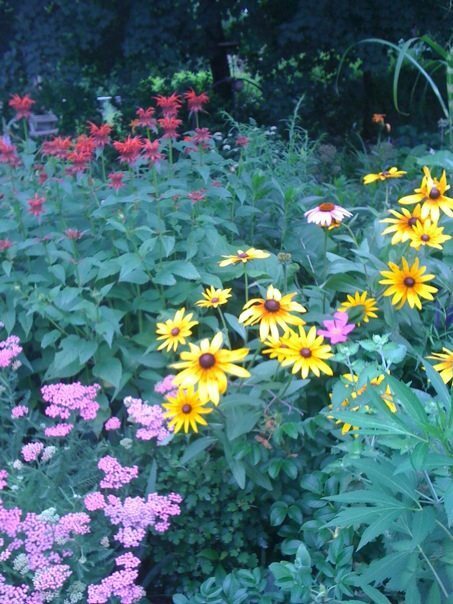 There are nine distinct gardens here at Exotic Gardening Farm & Wildlife Habitat. 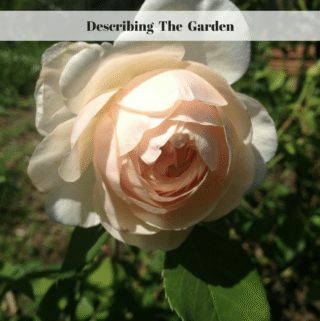 A descriptive and pictorial view of each garden awaits. Access this information by clicking on the links below. It’s been a long journey and a labor of love to create these gardens. The work isn’t over yet – in fact, on some of the gardens, it is just beginning. Variegated Solomon’s Seal growing above ajuga. The walnut garden resides up the hill and to the left side of the house. It is the garden that borders my neighbor on one side. It is named this because there are numerous large black walnut trees growing there. I did not plant them, they came with the house. I like black walnuts, so the trick was figuring out what else would grow up there with them. Over the years, some wild raspberries took root. I have left them and pick them every year. 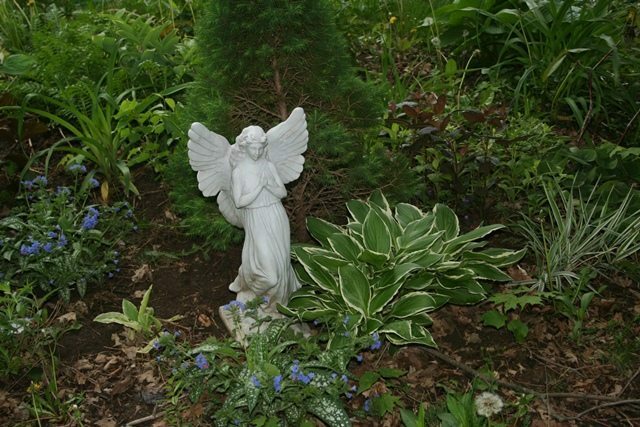 I have found other plants that thrive underneath the trees – daylilies, hosta, columbine, Solomon’s Seal, paperbark hickory, lilac and a self-sown rose. On the outer edge of the garden, far away from where the walnut tree limbs reach, I have planted numerous evergreen trees of various types for border privacy. I planted more lilacs, bittersweet and Rose-of-Sharon along the edge of the property line as well. To add color, I interplanted planted tulips, iris, passiflora (maypop), valerian and yucca among other miscellaneous plants. It’s always interesting to see what comes back from year-to-year. Spring is such a pretty time of year in the garden. I love all the vibrant colored spring bulbs and the blue and yellow flowered ground covers that are starting to naturalize. The sprawling front garden begins on the edge of the driveway and continues across the front of the house right down to the edge of the fence near the stop sign. I have no idea how large this garden is, but it is rather large. It is one of my favorite gardens because it is in full sun, very fragrant and in easy view of the house. I’ve tried a lot of different plants in this area – some thrive and some do not. Roses seem to like it and do quite well, thus there are numerous roses in all colors and sizes. I like fragrant roses and tend to pick the old-fashion varieties, so spring really is the best time to see the roses. Other spring blooming favorites in this area include clematis, poppy, dames rocket, iris, peonies, valerian and columbine. I have a purple melic grass from Kew Gardens in this area that blooms (and multiplies) every spring. 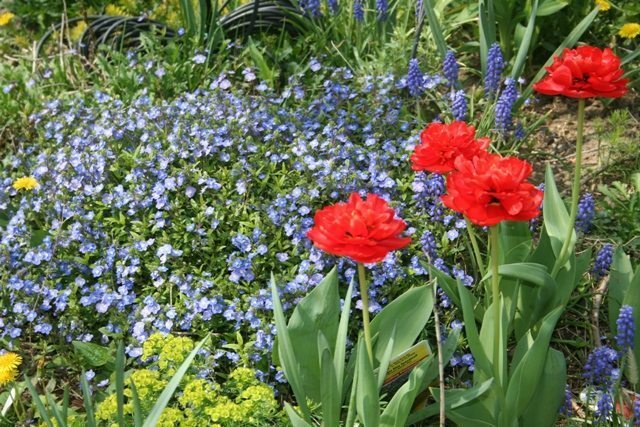 There is catchfly, catmint, love-in-a-mist, daylilies, Sweet William, allium ninebark, lilies and so many more plants. You almost have to walk through this garden on a daily basis to see everything. Have you ever noticed how peaceful a shade garden is? Even just looking at this photo of a portion of my shade garden makes me feel at peace. The shade garden borders the right side of the house and extends into the front garden area. It is lovely year-round especially since there is color in it even in the dead of winter. 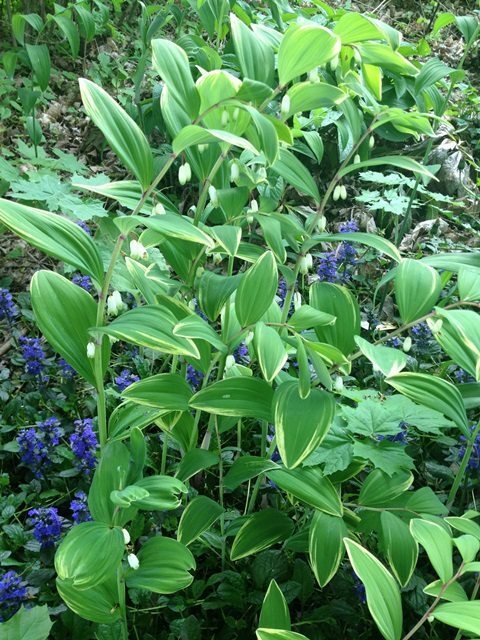 I have numerous varieties of hellebore, hosta, arum, monkshood, coral bells, geraniums, Solomon’s Seal, columbine, clematis, sweet woodruff, wild ginger, peony and native plants such as Virginia bluebells, jack-in-the-pulpit, trillium, bloodroot. This list is by no way complete. This is another one of those gardens that you simply must see. 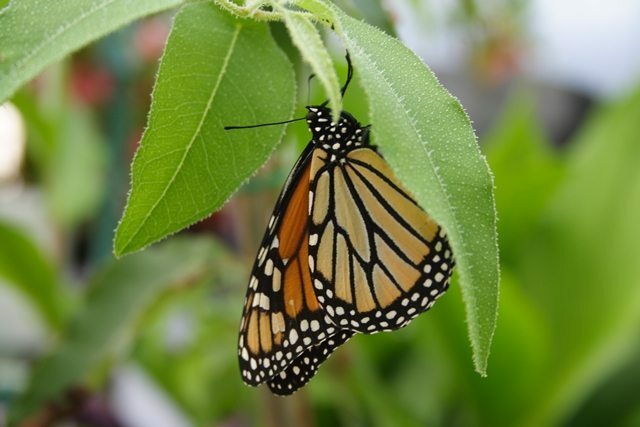 I truly love butterflies – and the farm is an official Monarch Watch Station. This Monarch Butterfly is on a lemon eucalyptus leaf. The butterfly garden was started about two years ago. It is still a work-in-progress. We intend to have a walk-through butterfly house where caterpillars are safe from predators until they hatch and are able to be turned out on their own. There will be regular release dates so the public can come and watch them fly away if they choose. There are two bogs in this area with plans to add one more – and a pond. There are places to sit and enjoy the butterflies as well. 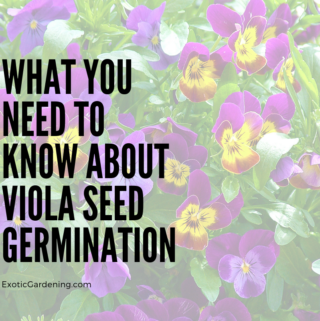 Plants in this garden include milkweed, rattlesnake master, coneflower, joe pye-weed, compass plant, stiff goldenrod, sweet shrub, buddelia, spirea, lilac, comfrey, roses, sedum, cosmos, weigela, lavender, catmint, salvia, queen of the prairie, false sunflower, hosta, hydrangea and many more. 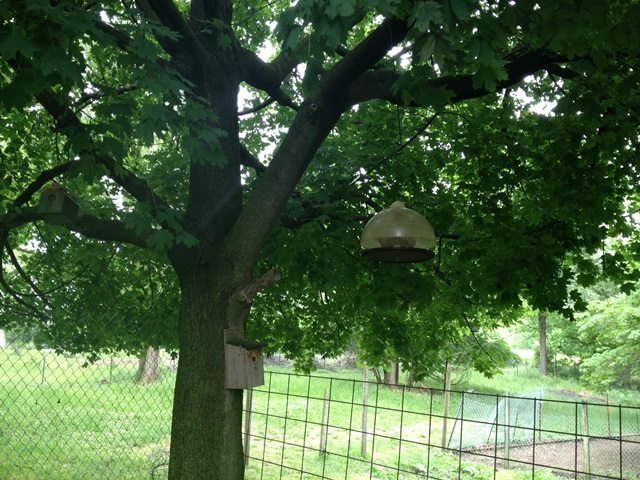 A bluebird house and a large bird feeder. The bird garden is still a work in progress. It was set up as a place for our chickens to free-range. Over the years, I have found that letting it grow naturally suits the chickens as well as the wild birds. I have some plants growing already, but intend to add more. The plants currently in this garden include Ohio buckeye, viburnum, ginko, lilac, privet, honeysuckle bushes, hollyhock, artemsia, wormwood, poppy, roses, yucca and iris. I intend to add sunflowers, safflower, white millet, corn, sorghum, broom sedge, black-eyed Susans, coneflowers, evening primrose, bee balm, red clover, goldenrod, peanuts, nyjer, lettuce and other plants birds and chickens enjoy. There are also plans to put in a large pond with boggy edges. This is Leonardo (angora goat), Tulip (cashmere goat) and in the background, Darla (dairy goat). The pasture is divided into five distinct areas because we rotate our livestock into an area until they eat the grass down, then close it off and move them into another area. Two of the main areas are pretty worn down by now, but that’s ok. There are three other areas where the grass is plentiful in season. 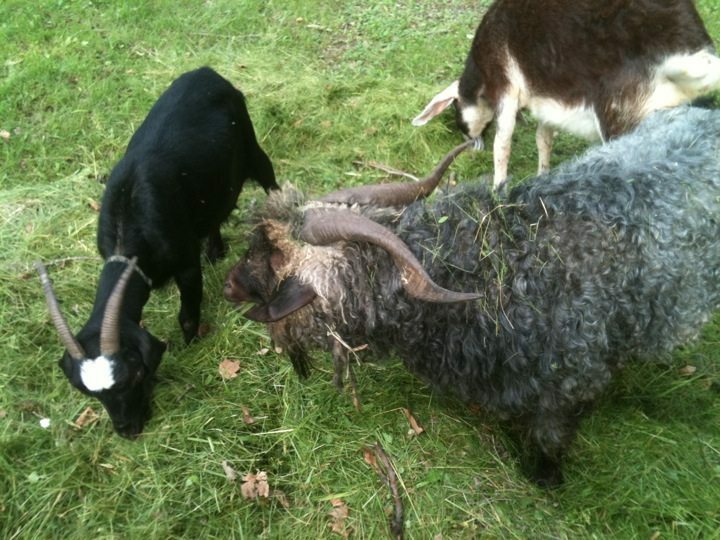 Our livestock currently consists of chickens, goats (dairy, angora and cashmere), a horse and Leicester Longwool sheep. This front bed has two straw bales in it that I will grow plants in. The rest of the raised bed is filled 1/2 of the way with soil and compost and 1/2 of the way with mulch. I have several varieties of herbs growing in this mixture right now and they are doing very well. 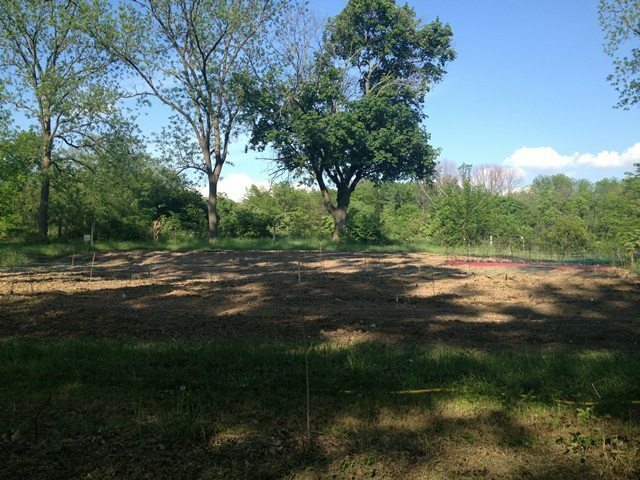 The experimental garden – as it was dubbed this year, was the old vegetable garden. Fruit trees growing there include apples, peaches, pears, cherries and plums. 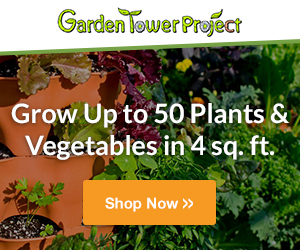 There are numerous herbs planted throughout the garden and a small tunnel house for year-round vegetable growing. 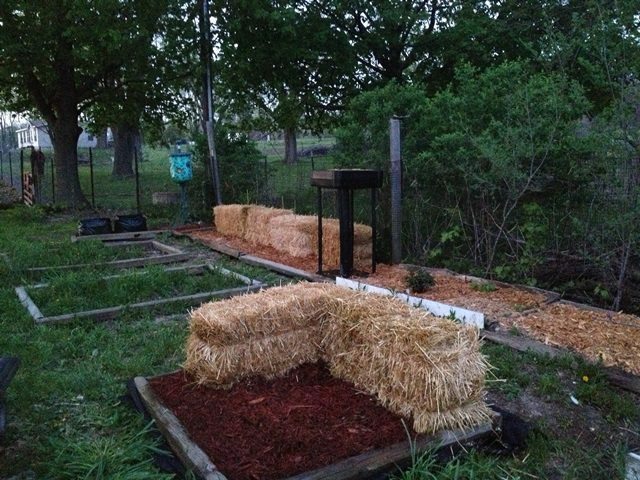 We intend to put in several hot beds for winter growing and this year tried straw bale gardening. I have numerous plants in this area growing in a wide array of containers – and really, anything goes in this area. It truly is for experimenting. Another view of the large vegetable garden. The area in front of the vegetable garden, right at the front of the photo, contains 13 roses and some strawberry plants. The far acre garden consists of the last acre of land we bought. There is a large vegetable garden, a native plant garden, apple trees, roses, peonies and “the hill” that I am currently landscaping with plants such as phlox, bee balm, yarrow, hydrangea and hosta. I have the space up there to also grow numerous trees, shrubs, ornamental grasses and bamboo – and I’m doing just that. Much of the ground is covered in moss under the large maple trees and I find that attractive and soothing. There are places to sit up there right next to the large pasture area. Figuring out what will grow up there isn’t always easy since the plants need to be fairly drought tolerant once they are established, but landscaping this area is certainly fun. This is the view from the side doorway of the large greenhouse. 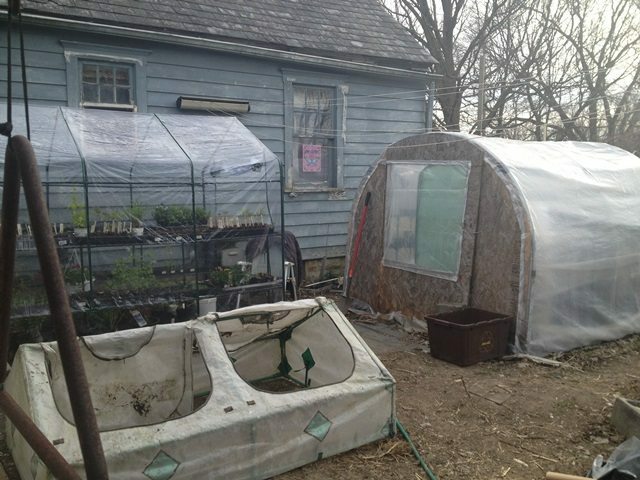 You can see a small coldframe, a larger coldframe and the rear of the heated greenhouse. The brown container is used for compost. The greenhouse garden area consists of a large greenhouse that is divided into several sections. These sections operate year-round and house a wide array of tropical plants. Some of these plants are edibles, some are highly fragrant and some are just ornamental. 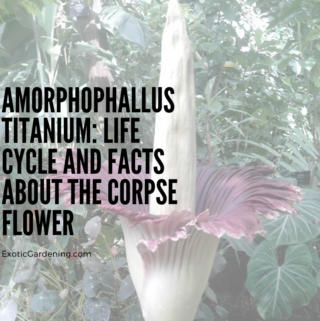 I tend to like unusual plants, so you will find many of these in the greenhouse. In addition to the year-round greenhouses, there are four walk-in greenhouses and a cold frame that are positioned right outside the area where the large greenhouse is. These houses and cold frames are used for seedlings and as a holding area during nice weather for plants that go into the garden. During late spring and early summer all of these greenhouses and cold frames are in use.